Boko Haram's Local Fight Suddenly Gets International Scrutiny : Parallels The group has been around for more than a decade, and the U.S. says it has links to al-Qaida. Boko Haram has now achieved international notoriety by kidnapping more than 200 schoolgirls. 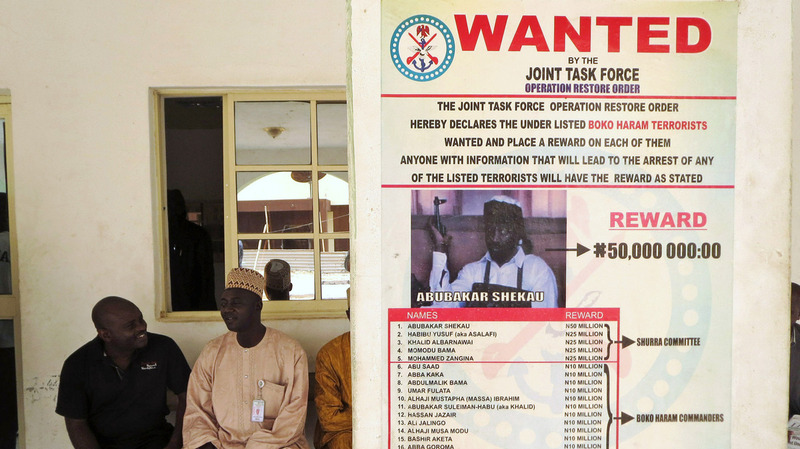 A "wanted" poster for Boko Haram leader Abubakar Shekau in Baga village in northeastern Nigeria, the region where the radical Islamist group is based. The radical Islamist group Boko Haram isn't new. The group has been around for more than a decade and has waged a bloody insurgency in northeastern Nigeria for the past five years. But it has suddenly achieved international notoriety by kidnapping more than 200 schoolgirls who have now been missing for more than three weeks. As NPR's Greg Myre reported Monday the group's leader, Abubakar Shekau, said in a video about the girls that he "will sell them in the market, by Allah." There's news today that Boko Haram has abducted eight more girls from a village in northeastern Nigeria. So how did this group emerge, and what does it want? Here's a primer. Boko Haram loosely translates as "Western education is forbidden" or "sinful." It was given that name by residents of the northeastern Nigerian city of Maiduguri, where it first surfaced in 2002. The group formally calls itself Jama'atu Ahlis Sunna Lidda'awati wal-Jihad, which is Arabic for "People Committed to the Propagation of the Prophet's Teachings and Jihad." What is the group's story? "Since the Sokoto caliphate, which ruled parts of what is now northern Nigeria, Niger and southern Cameroon, fell under British control in 1903, there has been resistance among the area's Muslims to Western education. "Many Muslim families still refuse to send their children to government-run 'Western schools,' a problem compounded by the ruling elite which does not see education as a priority. "Against this background, the charismatic Muslim cleric Mohammed Yusuf formed Boko Haram in Maiduguri in 2002. He set up a religious complex, which included a mosque and an Islamic school." The group adheres to Salafi Islam, and its ultimate goal is to create an Islamic state with Shariah, or Islamic law, at its core. And its influence, reportedly with the tacit support of local politicians, quickly grew from its base in Borno state to other nearby states. In 2009, the group's members were involved in several clashes with security forces, prompting a government crackdown. Its leader, Yusuf, was captured and later executed. "Boko Haram went underground and a year later launched attacks on police officers, police stations and military barracks, explicitly in revenge for the killings of Yusuf and his comrades. Its spokesman demanded prosecution of those responsible, release of their detained colleagues, restoration of the mosque and compensation for sect members killed by troops. Since 2010, the group's campaign has grown, targeting not only security forces, government officials and politicians, but also Christians, critical Muslim clerics, traditional leaders, the U.N. presence, bars and schools. Lately it has evolved into pure terrorism, with targeting of students attending secular state schools, health workers involved in polio vaccination campaigns and villages supporting the government." Who is the group's leader? A BBC profile last year described the group's current leader, Abubakar Shekau, as a "fearless loner, a complex, paradoxical man — part intellectual, part gangster." Shekau was believed killed in the 2009 government crackdown on Boko Haram, but less than a year later he emerged in videos as the group's new leader. He has not been seen in public since that time. Instead, he appears in periodic videos, such as the one in which he says he plans to sell the abducted schoolgirls. "Mr. Shekau is also the group's spiritual leader — and, judging by video footage, he seems equally comfortable delivering sermons to his followers." Last year, Nigeria's military announced that he'd been killed in operations. Again, they were wrong. How is Boko Haram structured? "The movement, never very hierarchical, is more dispersed than ever, with many leaders in the Adamawa mountains, Cameroon, and Niger. ... [I]t is fragmenting into factions, including the relatively sophisticated Ansaru, which focuses more on foreign targets. Able to move fairly freely, these groups are unlikely ever to be completely suppressed." And a 2012 report from the U.S. Institute for Peace noted: "It is difficult to see how there can be meaningful dialogue between the government and the group. The group's cell-like structure is open for factions and splits, and there would be no guarantee that someone speaking for the group is speaking for all of the members." What else is it known for? Prior to the recent kidnappings, Boko Haram successfully carried out an attack in Benisheik, Nigeria, in September 2013, killing 160 people. Perhaps its most high-profile attack was a suicide bombing of the U.N. building in Abuja, the Nigerian capital, in 2011; 21 people were killed, and dozens more injured. Last year, the U.S. State Department noted that Boko Haram has links to al-Qaida in the Islamic Maghreb, and offered a $7 million reward for information leading to Shekau's arrest. In 2011, a House Homeland Security subcommittee called the group an "emerging threat to the U.S. homeland."